Maine has been on my bucket list for a while. A long while. Since precisely September 2006. And how do I know that so precisely? Because that’s when Vogue published Arthur Elgort’s “The Maine Event” with model Coco Rocha, and I fell in love for life. Maybe it was because I was looking at those images from my florescent-lit cubicle in sunny Orange Country, California. Maybe it was because I hated the sun and the palm trees and the perpetually warm weather that I dreamed of a life entirely different from the one I was living. I dreamed of the opposite corner of America. A cold snowy place. A place with lighthouses and rocky shorelines. A lonely and isolated place. Somewhere to fall quietly in love. That place was Maine, and these photos were what fueled a fantasy that lasted nearly a decade. I tried to go to Maine before. I tried every which way. After all, I'm not the type of person to keep something unchecked on my bucket list for that long. But Maine was put on the backburner when I quit my job in California to travel for two months in Japan, anad a month in Europe n 2008. It was cast aside when I moved to Oregon and started my life over. In 2009 I bought tickets on Greyhound from Boston to Augusta. (Why on earth I chose Augusta I do not know). But that Greyhound bus departed without me. Due to work commitments I had to postpone my trip to Boston, and when I finally went to Massachusetts in 2010, there was no time for Maine, a mere 2-hour drive north. Maine was moved down the list while I traveled in Scandinavia, the middle east, and Taiwan. Maine was almost forgotten when I moved to Japan, then traveled around SE Asia for 6 months. But when I retuned to Oregon, I received an invitation to a wedding in Raymond, Maine. The date was September 2015. Nine years after the Vogue photo shoot. Thus I began planning my great trip to Maine. I knew a few things for certain. I would go alone. That’s how I always envisioned it. That’s how it had to be. I had many offers for company. My partner, friends in Portland, friends in Boston. But I knew this trip had to be a solo one. I would rent a car and road trip all over the state. No more Greyhound. 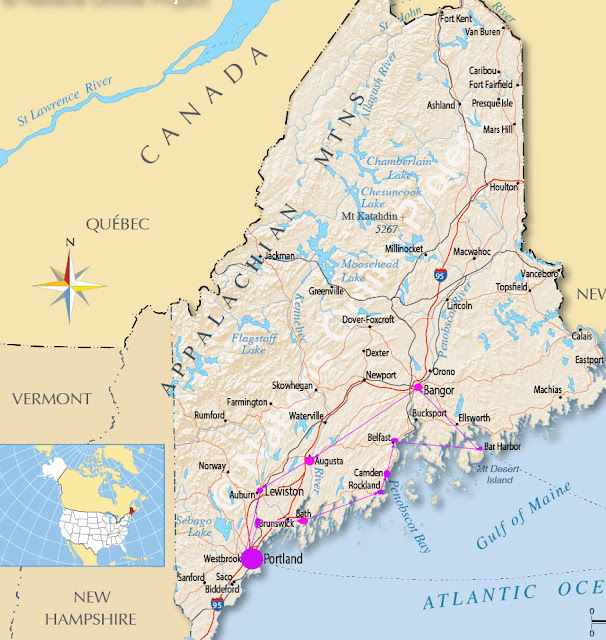 Maine is a state you need to explore with independence. There was too much to see and too little time for me to rely on public transportation. I would explore the coast and inland. The first part of my drive would be along the winding coastline, which all the quaint seaside towns and lighthouses. The problem is, this is also the most touristy part of Maine, and I hate tourists. I wanted to get a look at life on the inside, so I would drive back through the cities and capital. I would focus my trip on a few things I wanted to indulge, the lighthouses along the coast, lattes at every major café in Portland, lobster eaten as many ways as possible, and small town libraries. I made meticulous list. I planned every day of the journey. When I boarded the plane for my midnight flight to Boston I was overwhelmed with anticipation. This would be a six-hour red-eye journey, then two-hour shuttle bus ride from Boston Logan Airport to Portland, Maine. It didn’t feel real. After nine years of dreaming I was finally flying through the darkness to meet my dream in p the other side. What if reality couldn’t live up to my fantasy? After all, my dream was based on a Vogue photo shoot, hardly a good benchmark for real life. What if I didn’t like Maine? What if I got lonely? But I had to get ready to face real Maine, and real me….